Secret Service agents are supposed to guard and protect (“take the bullet”) the President of the United States with their life. Kerry O’Grady is a senior Secret Service agent at the Denver, CO office. 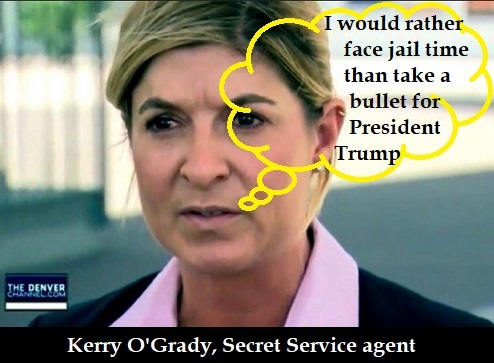 In 2016, O’Grady wrote on her personal Facebook page that, if Trump was elected POTUS, she would rather face “jail time” than take “a bullet” for him because she considered him a “disaster” for America, especially as it relates to women and children. After the media reported her anti-Trump comments, she said in an interview and written statement that the Facebook post should not be taken literally and that she would in no way shirk her duties to protect the president because of her opposition to his presidency and her support for Hillary Clinton’s candidacy. An internal Secret Service misconduct investigation led to her forced departure from the Denver office, where she hasn’t been seen since, although she remains on the payroll. Now we know what O’Grady has been doing with her free time. Susan Crabtree reports for The Washington Free Beacon, Jan. 10, 2019, that for a second year, O’Grady is helping organize a “Womxn’s” March on Denver on January 19 as a member of the event’s executive leadership team, according to the march’s website. Kerry O’Grady spent 25 years as a special agent in the mostly white, male-dominated field of federal law enforcement. She is a witness to the fact that institutionalized disparities and unconscious biases continue to prevent women and minorities from obtaining equality in the workplace and in the criminal justice system. She is determined to use her privilege and energy to mobilize around a movement that uplifts women and strives to dismantle systems of oppressions. Although the premier group for retired agents, the Former Agents U.S. Secret Service, expelled her from the ranks of associate members, O’Grady appears to remain on the Secret Service payroll and continues to live in Denver. Multiple sources close to the Secret Service told the Washington Free Beacon that although she has been sidelined from her previous role as the head of the Denver office, her name still appears on an internal agency “locator” of all active Secret Service agents and their contact information without any type of restriction or qualifier. In recent months, she crowed to other agents that she “beat” the Secret Service’s misconduct charges for her anti-Trump Facebook posts and that she plans to retire within the next 60 to 90 days. According to Truthfinder, Kerry O’Grady is only 48 years old. Congressional leaders have recently faulted other Department of Homeland Security agencies for the use of paid and unpaid leave to allow favored employees facing substantiated claims of misconduct to remain long enough to attain full retirement benefits. Outgoing Senate Judiciary Chairman Chuck Grassley (R., Iowa) last week released the results of a nearly four-year investigation into the U.S. Marshals Service, an agency where a flood of Secret Service agents have transferred in recent years. The new report specifically criticized the U.S. Marshals Service for allowing employees with substantiated misconduct to remain on paid or unpaid leave long enough to reach key retirement dates. Grassley said the probe uncovered a culture of misconduct that echoed similar problems his committee and others have uncovered at the Secret Service. Bigley also said O’Grady’s paid administrative leave is rare because all of his Secret Service clients facing misconduct charges were placed on unpaid administrative leave. Echoing Bigley, Cheri Cannon, a partner at the law firm Tully Rickey, said Secret Service managers often impose unpaid leave and revoke security clearances in misconduct cases in order to force a person to quit rather than go through the lengthy appeals process to try to get their security clearance reinstated. The Secret Service declined to comment about O’Grady’s employment status or any other matter related to her, nor did O’Grady respond to an email to her Secret Service email address seeking comment.